URBANA, Ill. – While winter can give gardeners a nice break from their usual garden maintenance, they undoubtedly miss the ability to harvest and enjoy the fresh garden bounty. “Grow fresh, flavorful herbs indoors this winter to add some green to your home and zest to your recipes,” says Brittnay Haag, University of Illinois Extension horticulture educator. Herbs grown in your home can be started from seeds or transplants from a garden center. When growing herbs indoors, use well-drained potting soil and at least a 6-inch-diameter container with a drainage hole. To ensure the plants do not get leggy and spindly, high levels of light are necessary. Most herbs will need at least six hours of direct sunlight. Plants can also be grown under fluorescent lighting for 12 to 14 hours a day, located 6 to 12inches above the plant. Plants grown in natural light should be rotated every few days to allow for even plant growth. Temperatures and humidity around the plants should be monitored to allow for adequate growth. Optimal growing temperatures should remain between 60 to 70 degrees Fahrenheit. Like any plant grown inside a house, avoid growing plants hear heat vents which may dry out the plant. One way to increase the humidity around the plants is to place the pots on a shallow tray of pebbles and water. A small fan in the room can provide adequate air circulation to avoid the spread of disease. Herbs should be watered according to the requirement of the plant. Some should never be allowed to completely dry out (e.g., rosemary), while others prefer the soil to dry - but not so dry that the leaves wilt - before watering again (e.g., sage). Herbs should be fertilized every two weeks with a liquid fertilizer, following directions on the manufacturer label. Over-fertilizing herbs can result in decreased aroma and taste. 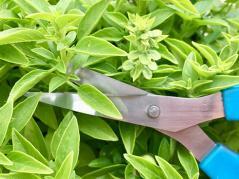 Just like herbs grown in the garden, trim the plants often to keep plants compact and to prevent flowering, which will decrease the flavor of the herb. When cutting the plants to add to a dish or salad, cut a few inches down the stem rather than picking off individual leaves. Parsley and cilantro stalks should be cut at the base of the plant. The general guideline when using fresh herbs instead of dried herbs is to use three times the amount specified. Growing herbs indoors this winter can be fun for all ages. “Get kids involved in caring and maintaining the plants and experiment with new recipes using the fresh herbs,” Haag recommends. For more information about growing herbs and new recipes to incorporate your harvest, visit the University of Illinois Extension herb website at extension.illinois.edu/herbs.